150 cards - 100 veterans and 50 rookies. Shop for base sets on eBay. Featuring uncut sheets of veteran and rookie base forms, including Refractor and X-Fractor parallels. 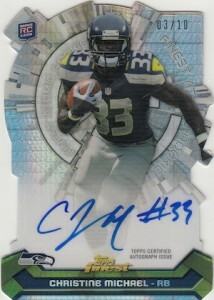 2013 Topps Finest Football, a hobby-only release, takes all the brand's hallmarks and runs with it. Think of it as a "If it ain't broke, why fix it?" sort of situation. Rookies, autographed relics and Refractors have long been key ingredients to the brand. All those return. 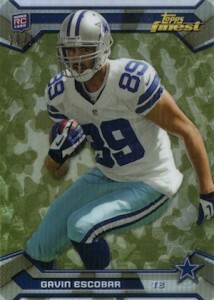 The 2013 Topps Finest Football base set has 150 cards, 100 veterans and 50 rookies. Parallels run the Refractor gamut. Basic Refractors (1:3 packs) and X-Fractors (1:6 packs) are not numbered, but five additional levels are. Rarer Refractors include Blue (#/99), Gold (#/75), Red (#/50), Prism (#/25) and Superfractors (1/1). There are also Printing Plates. Rookie Refractor Autograph Variations (#/50) come with on-card signatures from top 2013 first-year standouts. Blue (#/25), Red (#/15), Prism (#/5) and Superfractor (1/1) parallels add to the chase. Fresh faces continue to shine, literally, with Rookie Refractor Autographed Patch Cards, which fall one per box. The checklist has more than three dozen players with each card delivering both a signature and a multi-colored jersey swatch. Blue (#/99), Red (#/75) and Gold (#/50) Refractors come with a regular-sized swatch. New pink BCA and camo Military Refractors, both numbered to 10, have jumbo jersey pieces. Each card also has a trio of one-of-one parallels. Black Refractor Pigskin Shield cards come with the NFL shield from a football used at the NFLPA Rookie Premiere. Black Refractor NFL Shield and Superfractor are the other unique parallels. Autographed Jumbo Relic Refractors are also inserted one per box. Mixing rookies and veterans, more than 40 players are on the checklist. 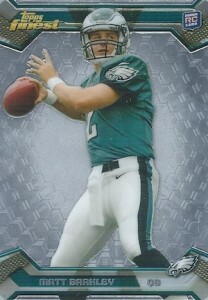 Like other parts of 2013 Topps Finest Football, there are several parallel versions. All are numbered, none higher than 99. Prism (#/25) and X-Fractor (#/15) versions have patch swatches. One-of-one Black Refractors come with a Nike Swoosh while Superfractors have a team patch. 2013 Topps Finest Football has some rare multi-player autographed relics. 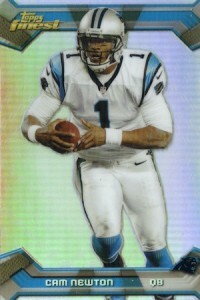 Dual and triple versions are numbered to 10 and have Superfractor patch (1/1) parallels. Five different Rookie Refractor Quad Autograph Patch Book Cards (1/1) have four colorful patch pieces to go alongside a quartet or signatures. 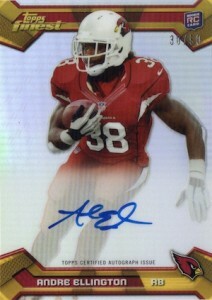 Not all the inserts in 2013 Topps Finest Football are about autographs and memorabilia. Atomic Refractor Rookies combine flashy backgrounds with a non-traditional card shape. The set has more than 30 cards with one in every box. 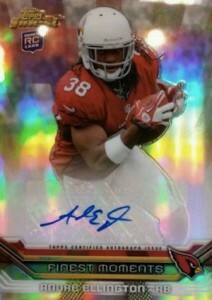 Red (#/25), Prism (#/10) and Superfractor (1/1) parallels come with an on-card autograph. Key career moments are highlighted in Finest Moments. Basic versions fall one per box. Refractors are inserted 1:2.5 boxes. Collectors can also look for autographed Prism (#/10) and Superfractor (1/1) versions. Redemptions have developed a bad name, and rightfully so. 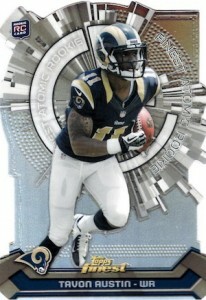 But 2013 Topps Finest Football has a pair of planned redemptions that add some pop. Uncut sheet redemptions offer up Refractors and X-Fractors. There is also one Mystery Rookie Redemption where the player will be announced during the season. As with recent years, 2013 Topps Finest Football is packaged in 12-pack boxes. Each is split into a pair of six-pack mini boxes. 2013 Topps Finest JUSTIN HUNTER BLUE REFRACTOR AUTO RC #1 25 BGS 9.5 GEM MINT!! Good: Manageable base set. Appealing Refractor subsets. 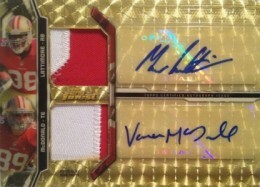 Great design on autographs and autograph patch cards. Bad: Missing inserts. Heavy on rookie autographs in a weakened rookie class. The Bottom Line: Like previous years, 2013 Topps Finest Football has high-quality cards at a mid-level price, making it a solid option for both hit and set collectors. 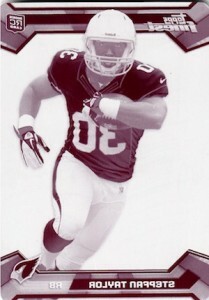 The 2013 base cards showcase a player’s photo against a silver background. The Finest logo is in the upper left corner and the player’s name is on the bottom. The backs have biographical information, a brief informational blurb about a key moment in the player’s 2012 season and stats. The base card design is among the top options in the business and certainly one of the best uses of Topps' Finest stock. Keeping with the Finest tradition, all of the cards feature action shots. The cards utilize a quality stock and are adorned with a beautiful chrome finish. The craftsmanship put into Finest is fantastic. From the base cards to the refractors, relics, and autographs, you'd be hard pressed to find an ugly card, even if the player is not great. Also, the Die-Cut Atomic Rookie Refractors are especially nice. The checklist is extensive, ranging from the biggest name prospects to young stars and veterans. Finest's checklist doesn't dabble in retired players, which is refreshing and gives it the type of continuity needed for set builders. A wide variety of Refractor parallels, color variations and die-cuts make for a nice master set capability for this product. Another appealing thing about opening a box that only contains 60 cards is that you don't get overwhelmed by junk inserts. I'll take a Refractor over an insert any day of the week. Even though you have two chances per master box to pull a top autograph, it will be hard for the value of any given box to live up to the hype of those players. Some might disagree with me since the potential is there, but 2013 was touted as a down year for rookie players, and that continues to be true. With the lack of dynamic early-round running back, wide receiver or quarterback talent in the 2013 draft, perhaps another autograph per master box would have put this set over the top. Also, our box was missing a few of the base inserts that are expected in each box. 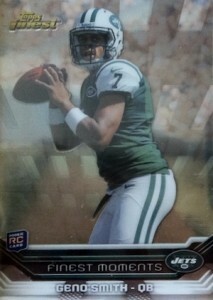 This is something to keep an eye on when opening a box of 2013 Topps Finest Football. I love the Finest mini box format because it's fun to feel like your opening two boxes in one. Very few mid-level products offer the degree of craftsmanship, continuity, and overall excitement that Finest does. I thoroughly enjoyed opening the box. Unlike the value, the fun factor is certainly there on this product regardless of what hit cards you pull. This is not a hit-only product, so collectors who enjoy base and inserts will also find plenty to enjoy. With the possibility of getting one of the cool die-cuts or rainbow variations, collectors should enjoy opening each and every pack. 2013 Finest Geno Smith Rookie Patch Autograph Prism Refractor Card #’d 25!!! Le'Veon Bell 2013 Topps Finest Auto Patch Black Refractor RC True 1 1 BGS 9.5!!! Why can’t this year’s version of Finest Baseball look as good as the football version? I don’t collect football cards but if I did this is a set I’d really go after. Is it releasing tomorrow or has date been pushed back? I believe it’s still tomorrow. great product and would be 4.5 stars if there were more teams with auto/patches about 10 teams have regular hits ..the rest are far and few…but it much nicer tha previous years ..and no more cards numbered over #/1000………how do you get your cards posted here if they are rare?? Every mini box is pretty loaded with refractors, some have 2 autos. Great return for a mid-priced box/case. I’ve opened two cases and gotten a 4-5 no name redemptions out of each case, multiple no-numbered jersey autos of the same people, can’t even make a set! This must have been the end of the run, but it’s the worst case distribution for both cases I’ve EVER seen!!! 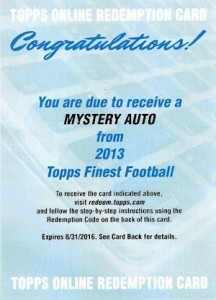 anyone know who the mystery player auto redemption is? Scott � No announcements yet. I definitely agree with the comment at the top; “If it ain’t broke, don’t fix it”! Topps Finest has delivered time and time again. All I will add at this point is that 2013 Finest can speak for it’s self in regards to quality, design, and hits! Easily best 2013 product this year. On card autos, great looking variations, and doesn’t hurt I pulled two supers from the few boxes I purchased. 2013 Finest Factory Sealed Football Hobby Box Le"Veon Bell RC ? ?